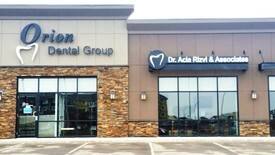 Our Lloydminster dentists, Dr. Acia Rizvi and Dr. Sarah Paul, provide dental care to patients of all ages. We believe that patients should be able to achieve a beautiful smile with confidence in the treatments they receive. At Orion Dental Group, we offer dentistry to families in Lloydminster, as well as Wainwright, Vermilion, and surrounding areas. Our entire dental team is dedicated to patient comfort. At Orion Dental Group, we are passionate about alleviating patient anxiety through oral sedation, ensuring a comfortable and pleasant experience every time. From implant restorations to teeth whitening procedures, Dr. Acia Rizvi, Dr. Sarah Paul, along with our capable staff, design treatment with your dental goals in mind. We look forward to meeting you and discussing how we can resolve your dental concerns. Please call our Lloydminster practice at (780) 875-0102 today!